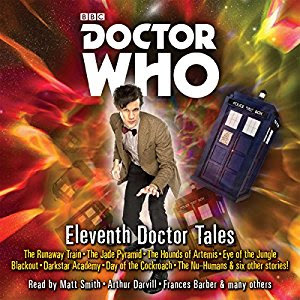 Given my enjoyment with the Tenth Doctor Adventures audio book, I suppose it was only natural that I'd eventually check out the similar title for the Eleventh Doctor. I just wasn't quite as prepared for how much longer this book would be given the significantly higher story count this time around. But this diverse collection is sort of all over the place in terms of Doctor Who stories, as is the nature of any anthology. There's perhaps a little something for everyone, but at the same time I felt like the Tenth Doctor collection had been a little tighter in terms of how it selected stories versus this one. It's still quite the amazing collection of original Doctor Who adventures and one that is totally worth an Audible credit at the very least. Synopsis: Doctor Who: The Eleventh Doctor Adventures - 11th Doctor Audio Originals is an audio book collection of 14 different by various authros and read by Matt Smith, Arthur Darvill, Clare Corbett, Meera Syal, David Troughton, Stuart Milligan, Raquel Cassidy, Alexander Armstrong and Frances Barber. This review is based on the Audible release of this title. The stories in this collection are all set during the Eleventh Doctor era when he had Amy Pond and Rory Williams as his companions. The stories are "The Runaway Train" by Oli Smith, "The Ring of Steel" by Stephen Cole, "The Jade Pyramid" by Martin Day, "The Hounds of Artemis" by James Goss, "The Gemini Contagion" by Jason Arnopp, "Eye of the Jungle" by Darren Jones, "Blackout" by Oli Smith, "The Art of Death" by James Goss, "Darkstar Academy" by Mark Morris, "Day of the Cockroach" by Steve Lyons, "The Nu-Humans" by Cavan Scott and Mark Wright, "The Empty House" by Simon Guerrierm, "Sleepers in the Dust" by Darren Jones and "Snake Bite" by Scott Handcock. As there are fewer readers than stories you're going to get a fair amount of cylcing between narators but it's always one narrator per story. This is still an audi book collection of stories read individually and was not staged as a radio drama or something. What I Liked: As with any short story collection, there will alwyas be those stories that really jump out and grip you more than others, and that varries from person to person. For me the first story that really stood out was "The Art of Death" by James Goss and read by Raquel Cassidy. Given it's a story that includs a gallery devoted to watching something called "The Paradox", you might get an inkling of the sort of narrative cleverness that comes with particular Doctor Who adventures. But it was quite well written with an appropriate ending to things. Ms. Cassidy did stand out to me as a particularly engaging narrator and I enjoyed the stories she read. Sure there's always Matt Smith for a certain degree of pseudo offical Doctor vibes and Arthur Darvil has such a lovely voice that is so relaxing and comforting for some reason. But Cassidy had a good storyteller's approach to things and a manner that made sure to really convey all the emotion of the story while making sure all the details remain clear. What Could Have Been Better: A lot of the stories in this collection, especially the first half or thereabouts, tend to not really know what to do with Amy and Rory as companions. It feels like they're mainly there for a few quips at the beginning of the story and maybe to get into trouble but rarely get a chance to contribute to how things are resolved in the end. And given my personal love for the "Ponds" as it were, I wish they had more of an active role in solving the problem of the story like what we see on TV. And this collection also featured more than one story that was centered around genetic manipulation and wanting to use the Doctor's Time Lord DNA as a template of sorts. I know it's a fair enough story premise but whoever edited / curated this collection maybe should have thought twice about putting them together in one set. It was a little disappointing to have both featured here. TL;DR: Doctor Who: The Eleventh Doctor Adventures - 11th Doctor Audio Originals is a fun enough set of stories and a nice way to continue to celebrate the quirkiness of the Doctor in a new way. It's a little lengthy as a collection and it means that you won't like a number of the stories as much as others, but that's how things go. And so the collection ends up with 3.5 cases of aliens wanting the Doctor's DNA out of a possible 5.